August 12, 2015. KDE today announces the release of KDE Frameworks 5.13.0. KBookmarkManager: use KDirWatch instead of QFileSystemWatcher to detect user-places.xbel being created. Search for required perl modules. Namespace a helper macro in the installed macros file. Private headers for platform plugins get installed. New proxy: KExtraColumnsProxyModel, allows to add columns to an existing model. krosscore: Install CamelCase header "KrossConfig"
Use correct qualification to call base method. Remove checks, QMetaObject::invokeMethod guards itself against that already. Cleanup coe: QMetaObject::invokeMethod is nullptr safe. Use QVarLengthArray to save the temporary QVector iteration. Move the hack to indent group labels to construction time. Fixup some serious issues with the KateCompletionModel in tree mode. Fix broken model design, which relied on Qt 4 behavior. As Varnish 4.x introduces various syntax changes compared to Varnish 3.x, I wrote additional, separate syntax highlighting files for Varnish 4 (varnish4.xml, varnishtest4.xml). Update the GLSL highlighting file. Private headers for platform plugins are installed. Platform specific parts loaded as plugins. Add in CMake bits to enable building of Voikko plugin. Implement Sonnet::Client factory for Voikko spell chekers. 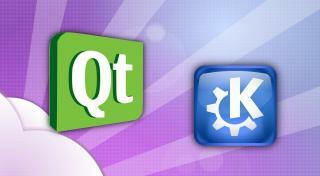 The complete source code for KDE Frameworks 5.13.0 may be freely downloaded. Instructions on compiling and installing KDE Frameworks 5.13.0 are available from the KDE Frameworks 5.13.0 Info Page. Building from source is possible using the basic cmake . ; make; make install commands. For a single Tier 1 framework, this is often the easiest solution. People interested in contributing to frameworks or tracking progress in development of the entire set are encouraged to use kdesrc-build. Frameworks 5.13.0 requires Qt 5.3.